How white are bleached teeth? I’ve had this question come up in discussions with dental writers and with patients who have a misconception about teeth bleaching. They understand that teeth tend to accumulate stains over the years. They absorb the pigments from coffee, highly pigmented fruits, wine, and other sources. Bleaching, they think, is a way to remove all those stains. They’re only partly right. Yes, bleaching will remove those stains, but it will whiten even the natural pigment in your teeth. Let me illustrate this with a couple of stories. It has a full spectrum of the range of shades a dentist is likely to encounter in natural teeth. When we needed a porcelain crown to match a patient’s other teeth, we could almost always find a shade in this guide that came pretty close to the patient’s natural tooth color. In the 90’s, when teeth bleaching became popular, we started to have a problem with this shade guide. 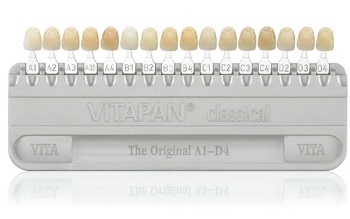 We would have people who needed porcelain crowns, and when we tried to find a shade that matched them, they would be “off the chart.” Their teeth would be much whiter than the whitest natural shade on the shade guide. In response, shade guide manufacturers developed new whiter shades. Ivoclar was the first manufacturer that I remember doing this, and our office purchased this four-shade guide and used it to communicate with dental laboratories. You can see that shade guide at the right. Serious cosmetic dentists will, of course, use this amplified shade guide because they are frequently dealing with patients who have bleached their teeth. Often, regular family dentists will only use the original A1-D4 shade guide. This led to a problem with one patient who e-mailed me around 2005. She had bleached her teeth, and was now getting porcelain veneers on four front teeth. Not knowing how specialized cosmetic dentistry is, she chose a regular family dentist to do these veneers. 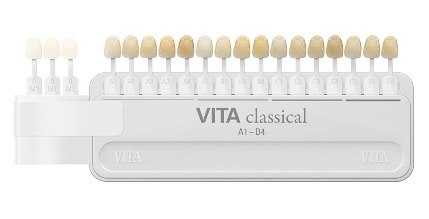 For the shade, this dentist selected the whitest shade on his chart. When the veneers came back from the lab, they were noticeably darker than her teeth. The dentist assured her that by using the whitest cement the veneers would match her teeth. She wrote to me, “Alas, this was not the result: there is at least an entire shade (if not more) of difference between my porcelain veneers and my other teeth.” I answered her that unfortunately, her dentist used the classical shade guide, and the whitest shade on that guide could be considerably darker than bleached teeth. For the full story, see the page under “Cosmetic Dentistry Horror Stories” where I discuss her question, can you bleach porcelain veneers? When my own children got all of their permanent teeth in, I let them bleach their teeth if they wanted to. Even though they weren’t old enough to have any accumulated stains, they were able to whiten their teeth significantly. So how white can you get your teeth? The results of studies seem to show that the longer you bleach, the whiter they will become, and no one, to my knowledge, has found the limit. The rate of whitening decreases the longer someone uses the bleaching gel, and everyone will hit a point where they don’t want to do it anymore. Some people get them so white that they seem to glow. What is your opinion of Premium Home Whitening products? I got an offer through Groupon for a product called Premium Home Whitening, for whitening your teeth. Is this a worthwhile product? I looked at their website, and I have a couple of comments. First, their teeth whitening agent is 35% carbamide peroxide. This is a valid whitening agent – it will whiten your teeth. And, with the exception of the “cold blue light” that they add to the process, which I don’t believe will accelerate anything, I don’t see any hocus-pocus in the technique or the products they offer. However, I can’t endorse what they are doing for a couple of reasons. You see, there are two problems with buying this kit over-the-counter. The first is the tray that they make is not going to fit nearly as closely as the one a dentist will make for you. So you are going to have a lot of leakage, which causes three problems. First, there is a reduction in effectiveness when the tray leaks. Second, you waste a lot of gel, which drives up the cost even more. Third, there is a greater chance of irritating the gums. And then there is the safety issue. I published a report a couple of years ago of a woman who needed a root canal on her front tooth because of the side effects of an over-the-counter whitening system. It’s always best to use this kind of thing under professional supervision. There are issues about existing dental work, exposed root surfaces, open margins on fillings, etc., that should be checked before starting whitening. For those reasons, you are much better off getting this service from a dentist. You do not need an expert cosmetic dentist for most routine whitening cases – this is one area of cosmetic dentistry where almost any dentist will do. Links: Can I whiten my teeth while nursing or pregnant? Three types of teeth stains. What do you know of the whitening product “Luster Premium White At Home Tooth Whitening Light System “? How safe is it? I looked up information about this Luster Premium At-Home Whitening System by Luster Oral Care, went through their website, carefully studied their ingredients and the comments of users, and it appears to me to be a phony. The light is way too weak to do anything, and I believe its purpose is purely psychological. The whitening appears to principally come from a pigment that is in the Super Whitener – zinc oxide. This will stick to the teeth and make them look whiter, and then it will gradually fade away. But it makes the teeth look whiter temporarily, and I believe this is why they get some positive reviews from people who write before the whiteness wears off. I wouldn’t waste my money on it. The only over-the-counter whitening system I’m aware of that works is the Crest Whitestrips. And you have to be careful with them – they can cause tooth sensitivity. You’re best off getting teeth bleaching done professionally by a dentist, but if you want to save some money, go with the Whitestrips. Crest Whitestrips damage a tooth. This is a follow up to a post of a couple of days ago: Crest Whitestrips Risks, where I discussed with Susan the root canal treatment she ended up needing for a tooth damaged by Whitestrips. I have a follow-up question, if you wouldn’t mind writing back. Was this Crest PROFESSIONAL EFFECTS Whitestrips, or Advanced Vivid? Or Vivid? Or another type of Whitestrips? Which product did you use, exactly? The lingering pain after the cold test is a strong indication that a tooth needs a root canal treatment, so I’m confident, from what you’re telling me here, that it did need that. And it is reassuring that your dentist didn’t think the Whitestrips would help your esthetic issue. I had assumed that your dentist had recommended this. The peroxide that is in the bleaching ingredient in the Whitestrips is irritating. I am aware of one case, a number of years ago, where a woman had exposed cavities and used the clinical-strength peroxide bleach on her teeth and ended up needing root canals. This was a very rare occurrence, and at the time was the only reported case of bleaching damaging a tooth. But the bleaching treatment was used contrary to recommendations. Now the peroxide in Whitestrips is fairly weak, and I have never heard of a tooth being harmed by that. I do not believe that there are any reports in the literature of this happening before. If the bleach did cause this, there needed to be some other compromising factor. Perhaps the gum recession left some exposed dentin. The root of your tooth is supposed to be covered with cementum, but in some cases, there is a gap between where the cementum ends and the enamel begins – an area of exposed dentin. Anyway, this is a very interesting case of teeth damage from Crest Whitestrips. I used the “Crest 3D Whitestrips – ADVANCED VIVID – once a day -14 whitening treatments”. I used them for 3 days and then stopped over the weekend and then used them 1 more day, forgot the next day, and then used them for 3 more days, making a total usage of 7 days. I had no problems with sensitivity until midday after using them on the 7th day. That is when my front incisor began hurting and then the pain increased daily. I contacted my dentist four days after the pain began and you know the rest of my story. How safe do you think I am in continuing to bleach my teeth using the other 7 packets left in the box? Like I said earlier, I’d much rather have yellow, healthy teeth than white, unhealthy teeth! Thanks again for your help and advice! Crest Whitestrips risks – Does Susan now need a root canal? My front left incisor was pushed back in my mouth 30 years ago in an accident and then put back into place by an oral surgeon. Since then it has been slightly discolored and the gum has been recessed from it very slightly. Just recently I asked my dentist about teeth whitening products and he suggested that I try CrestWhite Strips. After using them for 7 days with no problems my front incisor started to ache. I did not use the strips any more, yet the pain did not go away. I have not used the strips for 1 week now, yet my incisor still hurts when anything cold gets near it. It is sensitive to hot & aches much more when I exercise (even walking). It is not sensitive to pressure or being tapped on and feels ok as long as I am sitting and non-active. My questions for you are 1) Do you think I need a root canal? My dentist seems to think so. 2)Do you think the Crest White Strips caused the tooth to become infected? 3)If this was caused by the whitening product, than should my dentist not have warned me that this was possible? I’d greatly appreciate your input ASAP as my dentist wants to begin the root canal on Thurs., May 13. Your website has been extremely helpful! Thank you! I’m not sure why this incisor is hurting now. It is irritated. I don’t think it could be said for certain that it is infected. The sensitivity to cold indicates it is irritated. The sensitivity to heat is more a concern and tends to indicate that it won’t recover on its own. And the idea of bleaching this tooth with Crest Whitestrips wasn’t a good one. This dentist doesn’t seem to know much about bleaching. The Whitestrips are very mild and will whiten your teeth a little but not a lot, and they will whiten your front six teeth evenly, which would still leave this tooth darker than all the others. I would get a second opinion from an expert cosmetic dentist. I’m jumping to conclusions a little bit here, but this error of judgment on the bleaching to me reveals a serious lack of knowledge about cosmetic dentistry. As far as the bleaching irritating your tooth, that is possible. That’s why it is always a good idea to bleach under the supervision of a dentist. There are some rare instances where a tooth that is otherwise irritated or has exposed dentin has been “pushed over the edge” by bleaching it, but that is very rare, and I have never heard of that happening with Crest Whitestrips. As I said, they are very mild. Filed under: Crest Whitestrips risks. Susan wrote back a few days later and reported that she had sought a second opinion about the root canal treatment. The other dentist did cold tests on her teeth. On the affected tooth, the pain to cold lasted 2-3 minutes. This is a classic sign of a tooth needing a root canal treatment. Susan subsequently had the root canal on this tooth. This is a very unusual case, and may be the only reported case of this type of risk – a tooth being damaged by Crest Whitestrips. My recommendation is that Crest restrict their stronger whitening products so that they are only available for use under the supervision of a dentist, and that they issue warnings that these stronger products should only be used after a dental examination reveals that there is no exposed dentin on the teeth to be bleached. Another follow-up question from Dr. Hall about the tooth damage from Crest Whitestrips, where Susan explains the exact Whitestrips product she used and gives more information about the damage they caused. I doubt that the tooth bleaching system would weaken the bond on this tooth. Bleaching gel hasn’t been known to weaken bonds like this. Plus, if the bond were weakened, the repair to the chip would probably fall off – it wouldn’t just be this pain. The kind of pain you experienced can be caused by the bleaching gel on a sensitive part of the tooth. That’s what I would suspect. If this tooth was otherwise injured and repaired, there could be a sensitive place that used to be covered by some bonding agent and that has come off. Your case is a good illustration of why, when you’re doing teeth bleaching, you need to be under a dentist’s supervision. I assume that you are. You should let the dentist know about this, and hopefully they can find the exact cause of your problem. If it is indeed a sensitive spot, it could be coated with something to take care of the sensitivity, and you can go on with your bleaching. But get this solved before you bleach any more. Read more about sensitive teeth. Other links: Chicago porcelain veneers.